Immersive environments – such as virtual worlds and video games – have attracted attention as potential environments for work and learning. Forrester has predicted that, within five years, the 3-D Internet will be as important for work as the Web is today. 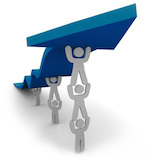 Gartner has predicted that 80 percent of Internet users will be in a virtual world by 2011. Second Life is the best known virtual world environment and has attracted a huge amount of interest from the learning community. In fact, Second Life is one of the most important innovations in online learning today. 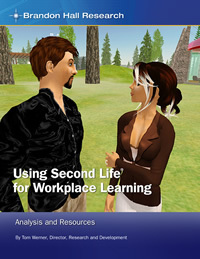 This report, “Using Second Life® for Workplace Learning: Analysis and Resources,” provides the key information you need to help evaluate the potential benefits of using this platform. Written by Brandon Hall Research Analyst and Second Life expert, Tom Werner, this report analyzes the current practices of using Second Life for learning and provides conclusions and recommendations for adopting this technology.